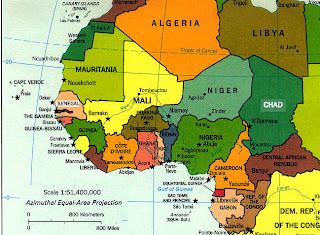 Are we witnessing another period of political instability in West Africa? After the August 2008 military coup in Mauritania, overthrowing the democratically elected government of President Sidi Ould Cheick Abdallai, and the military coup in Guinea-Conakry following the death of President Lansana Conte (see my December 23 posting), on March 2 President Joao Bernardo Vieira of Guinea-Bissau was brutally murdered, hours after the killing of the country’s army chief of staff, General Tagme Na Wai. The day before, a disgruntled junior naval officer failed to assassinate Guinea’s Navy chief, in Conakry, apparantly a further sign of instability in the country after the December coup. And in Mali and Niger Tuareg rebels have been staging deadly attacks on civilians and military personnel (2008). Though some of these countries are far away from Liberia, the violent events in Guinea-Conakry and Guinea-Bissau could easily have repercussions for Africa’s oldest republic. On March 1, a non-commissioned officer, Makan Oulare, tried to kill the country’s Navy chief in Conakry. Oulare was dissatisfied because he had not been promoted to a higher rank after the December coup, unlike some of his colleagues, in particular those serving on the National Council for Democracy and Development, the junta ruling Guinea after seizing power. Already, several members of the junta were accused of plotting against the government of Moussa Dadis Camara, the captain who seized power in December, and arrested in late January. And in a wave of arrests in the past ten days, a number of military officers and civilians have been rounded up, among them Ousmane Conte, the late President Conte’s son. Ousmane Conte, an officer in the army, is accused of drug trafficking. Guinea and surrounding countries, in particular Guinea-Bissau, have been targeted by international drug trafficking gangsters who take advantage of poorly policed coastlines and weak law enforcement institutions, and who use remote airstrips to smuggle Latin American cocaine through West Africa to Europe. Remember, in February 2008, almost 100 barrels containing about 2.5 tonnes of cocaine were seized from a ship off the coast of Liberia. It was the single largest drug seizure in the country’s history. The country that increasingly has the reputation of being a narco-state, is Guinea-Bissau, one of the poorest countries on earth. Guinea-Bissau has had coups and counter-coups, military revolts and a short civil war in the recent past. President Viera, who had ruled the country from 1980 till 1999 when he was ousted by a military junta that included Na Wai, had been re-elected in 2005. On March 2 he was assassinated, a reprisal for the killing of Army Chief of Staff General Tagme Na Wai, the day before. Already in November last year Vieira had survived a gun attack on his home by mutinous soldiers, in what was probably a failed coup. Following the killing of President Vieira, the country’s armed forces command denied that there was a miltary coup and pledged to respect democratic institutions. Under the constitution the Speaker of the National Assembly takes over the presidency for a limited period pending presidential elections. Today, on March 3, National Assembly speaker Raimundu Pereira was sworn in as interim head of state. But will the tension between rival armed factions disappear with the death of Bernardo ‘Nino’ Vieira and Tagme Nai Wai? Soldiers from Na Wai’s Balante ethnic group – the country’s largest – killed President Vieira, who is (was) from the much smaller Papel tribe. Besides, rumors point to the potential involvement of drug cartels in the assassination of Na Wai. This entry was posted in Guinea Bissau, Guinea Conakry, Liberia, Mauritania. Bookmark the permalink.